I'm sorting through my bags of dead leaves and such, and one bag contained these two Lonicera canadensis leaves and two tiny, dead wasps. The only agromyzid listed in (1) with this plant host is Paraphytomyza luteoscutellata, but I haven't checked the description of the mine to see if it matches. 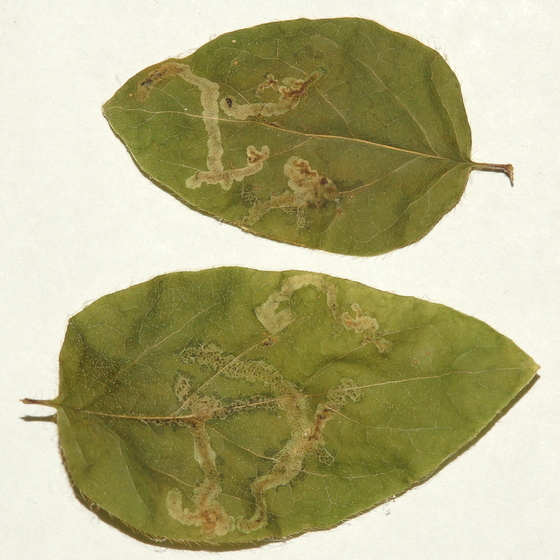 Moved from Leaf Miner Flies. Although described in (1) as producing "funnel-shaped" mines, the illustration [fig. 1046] shows a mine just like these.